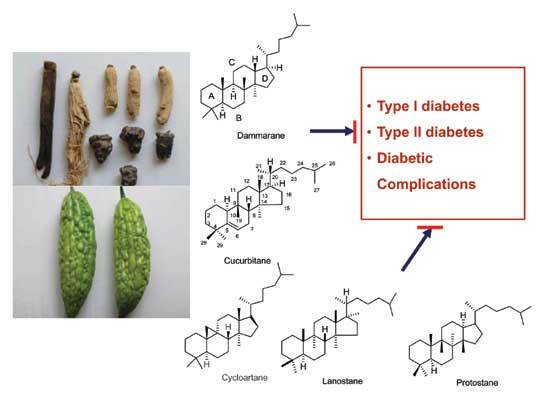 Tetracyclic triterpenoids, including the dammarane, cucurbitane, cycloartane, lanostane and protostane groups, is a class of triterpenoids widely distributed in various medicinal plants, particularly those commonly used for the treatment of diabetes and its complications, such as Panax ginseng, Panax quinquefolium, Panax notoginseng, Gynostemma pentaphyllum, Astragalus membranaceus, Momordica charantia, and Ganoderma lucidum. This review highlights recent findings on the chemistry and bioactivities of tetracyclic triterpenoids from these plants and other popular herbal medicines. Astragalus, diabetes, Diabetic complications, Ginseng, Gynostemma, Herbal medicines, Tetracyclic triterpenoids. Faculty of Pharmacy, the University of Sydney, NSW 2006, Australia.